At Champion Oilfield Service, our experienced supervisors have a broad range of skills that allow us to quickly assess and identify complex problems that can arise on oil and gas well operations. This level of expertise enables us to identify and resolve potential problems before they become critical issues. We integrate seamlessly with your organization. We will meet with you to determine your specific maintenance and monitoring requirements. We report to your designated contact person to ensure the highest level of flexibility in the field and information at your home office. At Champion Oilfield Service we will have qualified personnel onsite 24/7 monitoring your initial production. We perform Flow Back Monitoring and arrange trucks for hauling loads on an as needed basis. Safety is a primary concern while we are on site, particularly for new wells. We make sure everything is operating as designed. 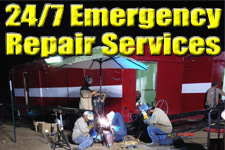 We notify you immediately when issues arise and quickly take steps to remediate any problems.